"I'm sorry I sound calm. I assure you, I'm hysterical." There are no communication barriers when you're speaking the international language of hipster, and no one has had a greater command of the tongue than late '80s/early '90s Jim Jarmusch. His early films (like Stranger Than Paradise and Down By Law) combined an almost Zen stillness with downtown cool; they occasionally cross the line into the mannered and precious, though, and that cultivated sense of alienation can get a little wearying. But in Night on Earth we're never any place long enough to get restless. The conceit of the piece is that it tells in succession five stories happening simultaneously, in five different cities—each one centers on a cabbie and an unusual fare, making this essentially a collection of five short films. In a funny way, the stories that feel the most forced are the English-language ones—it's almost like the actors are trying a little too hard, or perhaps being forced to read subtitles helps take the sting out of some of the rest of them. Anyway, the action begins in Los Angeles, with Winona Ryder posing more than she's acting—she's got oversized aviators, a baseball cap on backwards, a wad of bubble gum in her mouth, and a smoke held like a stick between her fingers, awkward with a cigarette like a good girl in high school taking a quick drag on the wild side. Her fare is Gena Rowlands, who plays a bigtime Hollywood casting agent—Rowlands is sort of the doyenne of independent cinema, and she's got her moments here, but her performance can feel sort of generic. It's fine that nothing much happens between them, but the problem with this particular story is that the characters aren't all that interesting. It's kind of notable that Jarmusch's weirdly alienated quiet persists anywhere on the globe, even at LAX. Armin Mueller-Stahl is behind the wheel in New York, an immigrant hack who picks up Giancarlo Esposito, a black man seemingly invisible to all the other taxi drivers. The cabbie's command of English is poor, but not as poor as his driving skills—the passenger actually takes the wheel, and they run into his mouthy sister-in-law, played in stock fashion by Rosie Perez. (Seeing her and Esposito together, and on the streets of Brooklyn, you can't help but think of Do the Right Thing.) Then it's off to Paris, with a driver from the Ivory Coast who isn't taking any merde from anybody, certainly not the businessmen trying to have fun at his expense—he meets his match with his next passenger, a blind woman, who doesn't give a damn about his fascination with her ability to negotiate her surroundings, and gives him an abject lesson in self-sufficiency. Roberto Benigni essentially provides an extended monologue in the Rome story—his wacky little arias and schtick have become his signature, and his fare is a priest, who really has the only appropriate response to the nattering on. And finally we go to Helsinki, in the dead of a winter night—three hopeless drunks pile into the cab ready to pour out their sob stories, but their driver counters with one of his own, that's worse, longer and more heartrending than anything they could have imagined, loaded or sober. The whole project doesn't really cohere, and it's probably not supposed to; that makes it kind of a natural for DVD viewing, and the fun of the movie in some respects is seeing how Jarmusch and his team are going to let the local culture seep into their house style. It's got something of a throwaway flavor to it, even if it does hopscotch the globe. Image Transfer Review: Well transferred, with a slightly raggedy indie feel that only adds to the movie's indie pedigree. It looks particularly good in comparison to other low-budget pictures from the period on DVD. Audio Transfer Review: The music can be inappropriately piercing at times—perhaps that's the effect they were after, with the opening credits especially with Tom Waits' growl, but it does kind of throw off the balance of the mix. A 1992 interview (5m:49s) for Belgian TV with the director, pegged to the original theatrical release, was shot perhaps inevitably in the back of a cab. And the conceit of the accompanying booklet is that each of its five essays are from writers in the cities where the film is shot—especially notable is the piece by Thom Anderson, whose documentary Los Angeles Plays Itself is one of the great lacunae of the DVD catalog. 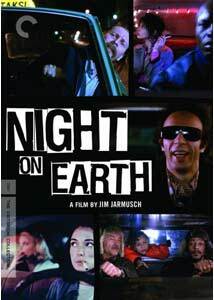 Jarmusch's movie has a casual, almost tossed-off feel to it, though obviously it's a production that required foresight and organization rather than just hopping on a plane with a film crew. It's kind of a nice collection of loosely thematically related short stories, done up well on this DVD.